A multitude of co-curricular musical opportunities are available to students at Woodhouse Grove – whatever instrument they play and however they like to play it! 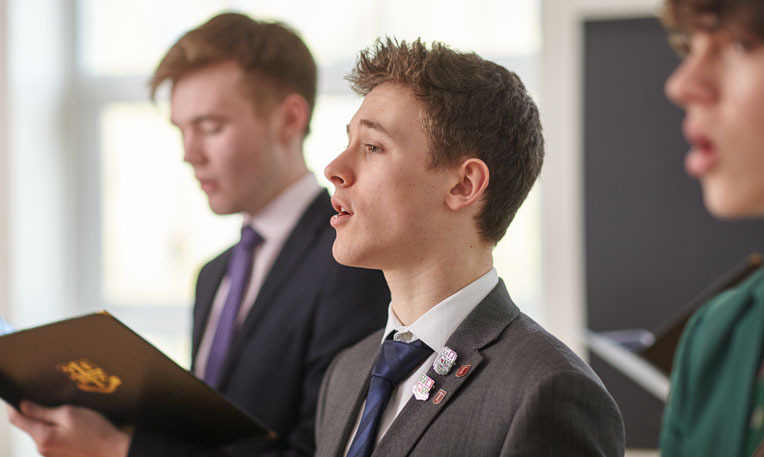 Strains of every kind of music genre can be heard drifting form the Performing Arts faculty and numerous performances throughout the year allow pupils to showcase their work to peers, staff and friends and family. Our large ensembles rehearse both after school and at lunchtimes. These Include chamber orchestra, concert band, junior orchestra and swing band. We also have a variety of Chamber Ensembles such as senior Brass Group, Flute Choir, Senior and Intermediate Saxophone Group, Senior Chamber Ensemble, Clarinet Group and Junior String Quartet. For those who like to play, sing or simply sit and listen, Woodhouse Grove Music has something for everyone.